You know what happens when you don’t drink for the 30 days leading up to Thanksgiving? You think about drinking, that’s what. You think about mixing cocktails with the booze bottles that have collected dust on the bottom shelf of your pantry. You literally salivate each time your husband pours himself a beer to enjoy on the couch after the kiddos have gone to bed. At least, that’s what I did. And then when THE DAY came, the day when my self-imposed, 30-day, no-drink ended, I realized I like the idea of drinking far more than the actual drinking. But, I did come up with a drink idea or two. And it wouldn’t be right if I didn’t a) test the ideas, and b) share them with you! Hendrick’s gin was, very unfortunately, one of the aforementioned bottles that has been neglected over the past couple of years. We used to be pretty tight, me and Hendrick’s. In fact, my pal Erin and I once did a little drink series that featured Hendrick’s gin a time or two. But that was before kids. And I don’t think either of us get the opportunity to mix up a cocktail as often as we used to. But that certainly doesn’t mean that we don’t appreciate them like we once did! Anywayyyy, let’s get to this recipe, shall we? 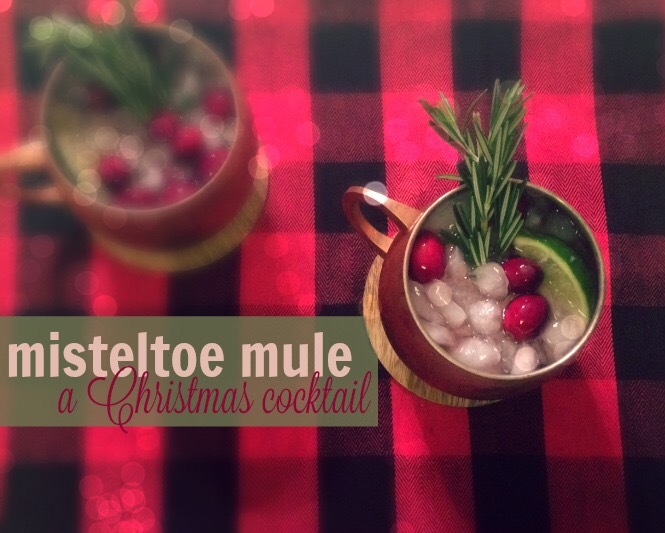 As the name might suggest, it’s a little spin on the traditional vodka-based Moscow Mule, with a Christmas twist! I used to pretty much exclusively drink Hendrick’s in the summer because of its light, cucumber flavor, but with Christmas tree shopping on the brain last week, I realized that I’ve long been ignoring the juniper flavors that are so perfect for Christmas time! And in addition to the booze bottles gathering dust, I had some copper cups that were begging to be used. So there you have an entirely too long story about the inspiration for the drink, and now I’m finally getting to the actual recipe. Short stories have never been my thing. 12/15/16 EDIT: When I was enjoying one of these last night, I suddenly remembered that Erin created a very similar cocktail. I’m pretty sure I even watched her concoct it on Periscope (does that still exist?? ), yet I didn’t think of this when I was dreaming up my version. I didn’t think of it when I mentioned our cocktail series up above. I didn’t think of it when she commented on this very post. Nope. I thought of it last night, which I’ve now come to realize is exactly one year after she posted her recipe. So I’m going to blame it on a latent memory from this time last year. A time of my life in which I was suffering from a “condition” I’ve affectionately dubbed “extreme sleep deprivation due to two babies who think nighttime sleep is optional“. I guess the silver lining here is that perhaps there are other memories tucked away that might surface sometime soon? But mostly I just feel bad for basically copying my best blog pal without even realizing it. You know what they say about great minds though! Cheers! Oh man that drink series feels like a lifetime ago! How do we both have two kids now??!? I am loving this recipe for so many reasons. Hendricks, ginger beer, cute garnish….it’s all there! Making this during the Christmas season FOR SURE.